crawling tunnels in the Natural Play Area. 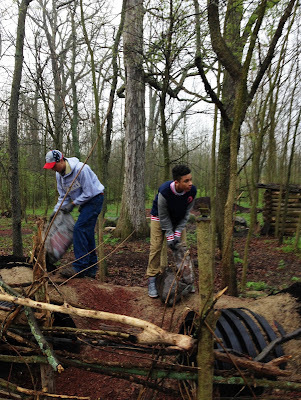 Recently students from the Achievement Center for Educational Success (ACES) partnered with the Darke County Park District to make the parks a healthier, prettier, safer, and more fun place to explore, learn, and enjoy. They worked hard putting down fresh mulch in the Natural Play Area which caters to exploratory play for all ages in a natural setting. Over 200 lbs. of trash made its way from the trails and grounds of the parks to the dumpster where it belongs. The students also removed invasive plants making more room for native varieties and planted new trees in areas where the emerald ash borer has killed off many existing ones. The Darke County Park District would like to extend a huge thank you to ACES for all their hard work to make the parks even better. ACES is an alternative education program for students in grades 9 through 12 who are credit deficient or looking for an alternative learning environment. The program is designed with a philosophy that all students can learn and can succeed when the conditions are conducive to their personal and educational needs. The mission is to provide a structured and supportive environment for students who need a different educational choice in order for them to thrive. The coursework includes focused and specialized curriculum for the students. The program also incorporates activities and services that promote personal development, address prevention and intervention. For information on how groups or individuals can get involved and volunteer with Darke County Parks, please call or email Volunteer Coordinator, Kathi McQueen at (937) 548-0165 or kmcqueen@darkecountyparks.org.